MobyMax, a provider of personalized and blended learning curriculum for K-8 students, released Cognitive Skills Science, a new Touch Curriculum subject that uses more than 20,000 cognitive skill manipulatives to deepen students’ mastery of science concepts. 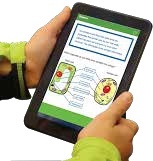 MobyMax’s Touch Curriculum technology makes science engaging and captivating as students use problem solving and critical thinking skills to learn science. The Cognitive Skills Science curriculum is perfect for both personalized learning and the blended classroom. The curriculum creates a solid STEM foundation in the Next Generation Science Standards (NGSS) domains—life, physical, earth, and space science.